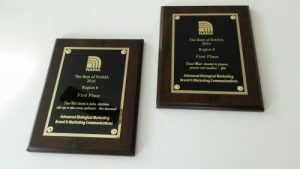 Brand It Marketing Communications has been awarded two first place awards for BEST OF Region VI through the National Agri-Marketing Association (NAMA). Both Region VI awards are for the work they produced for client Advanced Biological Marketing (ABM) in the Direct Mail for farmers, growers and ranchers (flat) and Direct Mail for dealers, distributors, sales reps or others serving agribusiness (three dimensional) categories. The award-winning “SabrEx for Wheat/Cereals Mailer” and “Trichoderma Takes a Little Digging” direct mail pieces were both developed for the Van Wert, OH company, Advanced Biological Marketing. For the Wheat/Cereals Mailer, Brand It Marketing worked with ABM to identify a target audience in a territory which did not have a history working with ABM. The goal and successful outcome was to create product brand awareness and to show the advantages of using SabrEx for Wheat, even on naked (untreated) seed. The second campaign, Trichoderma Takes a Little Digging, was used to show appreciation and generate interest at the ASTA (American Seed Trade Association) annual meeting in Chicago. Trichoderma works in the roots of the plant, in the soil. The piece explained what Trichoderma is and what it does. The “BEST OF NAMA” honors and awards the best of the best in agricultural marketing communications. All submissions to NAMA are evaluated for agricultural marketing effectiveness and creativity, and are hand-selected by a panel of roughly 50 industry experts. The BEST OF NAMA competition originated in 1988 to honor outstanding work by NAMA members, while educating members of the agriculture industry and feature top-of-the-line advertising. These awards have helped to raise the quality of the agricultural industry’s overall communication efforts throughout the years. Brand It Marketing will advance to compete at the National level for both awards. The national awards ceremony will take place on April 26th, 2017 at the Sheraton Dallas hotel. Brand It Marketing is a full-service marketing agency with a combined 100+ years of experience in the print, media, web, and campaign industries. They are an established team of innovative designers, thinkers, and creative strategists focused on helping your business grow. Many of their clients use them as their marketing-arm to become experts in their industry and manage their overall brand image. Brand It Marketing operates under guiding principles based upon integrity, professionalism, and mutual respect. For more information, please visit www.branditonline.com. Advanced Biological Marketing (ABM) provides solutions for commercial agriculture using biological seed treatments that increase a crop’s potential and yield. Its product line includes biological seed enhancements for corn, soybeans, wheat, and many other crops across the globe. ABM headquarters are in Van Wert, OH. For more information, please visit www.abm1st.com.